On Tuesday, January 22, 2013, The UsuryFree Eye Opener surpassed a milestone – 1000 visitors for the 24 hour period from 7:00 PM (EST) on Monday, January 21, until 7:00 PM (EST) on Tuesday, January 22, 2013. On January 22, 2013, 1006 visitors came to read articles at The UsuryFree Eye Opener – we had previously been averaging 500 to 600 visitors each day. Some of the new visitors have been asking about the history and purpose of the UsuryFree Eye Opener so this article will offer some background information. What is the UsuryFree Eye Opener? What is the ultimate objective of the UsuryFree Eye Opener? Who are the UsuryFree Creatives? Why the UsuryFree Eye Opener is twinned with the SDI (Self Directed Income) Eye Opener? From the blog The UsuryFree Eye Opener: "The UsuryFree Eye Opener is the electronic arm of the UsuryFree Network. It seeks active usuryfree creatives to help advance our mission of creating a usuryfree lifestyle for everyone on this planet. Our motto is 'peace and plenty before 2020.' 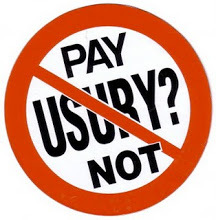 The UsuryFree Eye Opener publishes not only articles related to the problems associated with our orthodox usury-based, debt money system but also to the solutions as offered by active usuryfree creatives - and much more for your re-education." "While Cultural Creatives are a subculture, they lack one critical ingredient in their lives: awareness of themselves as a whole people. We call them the Cultural Creatives precisely because they are already creating a new culture. If they could see how promising this creativity is for all of us, if they could know how large their numbers are, many things might follow. These optimistic, altruistic millions might be willing to speak more frankly in public settings and act more directly in shaping a new way of life for our time and the time ahead. They might lead the way toward an Integral Culture." UsuryFree Creatives often see themselves as a subgroup within the larger group of Cultural Creatives. The focus point of usuryfree creatives is to re-educate our fellow citizens that Life Without Usury (Interest) is possible again in this 21st Century as it was in the Middle Ages. UsuryFree Creatives are commonly found as active participants within the growing movement of local communities that are launching usuryfree community currencies to use as a complement with their diminishing amounts of paper notes of federal cash. To qualify as an active usuryfree creative one must be aware of the design flaw of usury and know that it functions as the killer machine in our orthodox system of economics. As a usuryfree creative one also supports the growth and expansion of the usuryfree time currency movement as our last, best alternative that will aid us in setting up our 'economic lifeboats' in our respective local communities so that we-the-people can negotiate trades when their (the usurers') Titanic of usury-based debt money goes down. Usuryfree creatives acknowledge that financial freedom is denied to all debtors the moment the ink dries on the promissory note held by the creditor - to whom the "system" has given the power to exact usury on any loan or mortgage. It is noteworthy that the creditors (banks) never create the "interest" or "usury" portion of any loan or mortgage. Only the principal portion of any loan or mortgage is created for the debtor. This malfunction of the design flaw of usury is the direct cause of wars, violence, poverty, scarcity and lack. Our modern economic system of usury-based, debt money is imploding at an unprecedented rate as this 21st Century Recession deepens to a Depression that is likely to make the Depression of the 1930's look like a Sunday picnic. Usuryfree creatives recognize that the death rattles of the greedy, global banking cartel are going to be chaotic. That is why the UsuryFree Eye Opener is offering FREE, re-education NOW!! The UsuryFree Eye Opener was birthed with a mission to observe and comment on problems related to our orthodox, economic system of usury-based, debt money, while advocating a usuryfree lifestyle as the optimal solution. Usuryfree creatives anticipate that a usuryfree lifestyle has the potential to rise as a phoenix from the ashes of usury-based, debt finance. After years of meticulous research, various usuryfree creatives have been envisioning a blog where items commonly dismissed as "not newsworthy" by the mainstream media can be posted with space for comments, opinions and/or links to other relevant information. Usuryfree creatives have been looking for a blog where visitors can find the real truth about what's going on in the world of local, national and global economics rather than accepting to be brainwashed and mind-controlled by the few remaining mainstream media monopolies that have become monsters through acquisitions. The UsuryFree Eye Opener includes news sources, information and articles on topics related to "economics" - and almost every topic that is open for discussion has some connection to "economics." Readers wishing to share an article about any topic that is important to them are invited to have it posted at the UsuryFree Eye Opener. The UsuryFree Eye Opener is twinned with the SDI (Self Directed Income) Eye Opener. The SDI industry - otherwise referred to as the multi-level marketing or network marketing industry - is positioned to lead the way with this innovative marketing concept as we progress into this 21st Century and usuryfree creatives are making a choice to spend their money differently by shopping from within their own loyal SDI networks. Readers are invited to read this article to acquire a better understanding of the power and potential of the SDI industry: "Analysis, Projections, Observations & Proposals For The SDI Industry." While conventional business marketing concepts are failing, the SDI marketing concept is gaining popularity, probably because it relies on the oldest and most powerful sales model - people talking to other people. Usuryfree creatives are invited to familiarize themselves with the SDI industry as it will facilitate the shift towards usuryfree living for everyone on this planet. It is predicted that successful SDI entrepreneurs will become a hot commodity for many companies retailing products and/or services - in the not-too-distant future. Usuryfree creatives commonly view themselves as "locavores" since they prefer to shop locally using a usuryfree time currency as a complement with their federal cash. The key element that attracts usuryfree creatives to the SDI industry is that SDI entrepreneurs have access to selected, quality products and/or services at wholesale prices. Usuryfree creatives know that these products from SDI companies can be sold to consumers whereby federal cash is paid for the wholesale portion of any sale and any usuryfree community currency can be accepted for any agreed upon percentage of the retail mark-up. Twitter: Follow "usuryfree" at Twitter. (b) Become a elf-appointed reporter and provide the UsuryFree Eye Opener with headlines, stories, website links etc. (c) As an active usuryfree creative contribute feature articles that expose the design flaw of usury for the evil and immoral weapon that it is and/or promote the usuryfree lifestyle as the optimal freedom experience for everyone on this planet. NOTE: Writers must have proof of copyright of any original material submitted. To begin the process of becoming a usuryfree creative simply visit the blog - The UsuryFree Eye Opener. You are invited to begin participating by commenting on any of the currently posted articles. Feedback, comments and suggestions in the form of compliments and/or constructive criticism. Be sure and refer your friends in cyberspace as well as your family, friends, neighbours and working colleagues. If you are so motivated, please link the UsuryFree Eye Opener to your website. We are currently exploring advertising options so that we can build a loyal network of usuryfree creatives who double as SDI entrepreneurs. We do not wish to advertise for any of the giant, trans-national corporations – instead we intend to advertise for small to medium-sized community businesses and home-based enterprises. The UsuryFree Eye Opener requires energy - physical, financial, spiritual and otherwise, to create, maintain, improve and expand our message of mass instruction. Thank you and welcome aboard. Tom J. Kennedy aka "Tommy UsuryFree Kennedy"
PS: U R invited to familiarize yourself with (a) the Year of UsuryFree Living (b) the Winged Lion Awards and (c) our annual celebration of "usuryfree living" by helping us to promote the "Ninth Annual UsuryFree Day/Week" from November 13th to 19th, 2013. Read some background details by doing a search at any search engine for (1) usuryfree day and (2) usuryfree week. Are You A Grateful Slave?